If you own an ExoPC, and you’re eager to know how to get Plasma Active, our new workspace and set of applications for consumer devices to run on it, this blog article will help you get going. Note: Plasma Active is in alpha state right now, it is basically usable, but you will find many rough edges. You should not try this unless you consider yourself an early adopter, or if you mind fiddling with bits and pieces. We are working towards an end-user ready product, but we’re not yet there. There are a few different options to choose from, I’ll quickly explain which to choose under which circumstances. MeeGo: Works well overall, but is lacking in key areas, for example we do not have a UI to connect to wireless networks yet, and as the device doesn’t have Ethernet (and cables are lame on mobile devices anyway). You can work around this with a trick Marco explains. Balsam Professional: Download the Balsam Professional live images from open-slx. This live image provides a fully functional live system without too much hassle. openSUSE: Install Plasma Active on top of openSUSE 11.4, it uses the Active packages created by open-slx (me, my employer), but is a bit more laborious to install. I will explain here how you can get to a state-of-the-art Plasma Active, using what will eventually become the Tablet Edition of Balsam Professional. 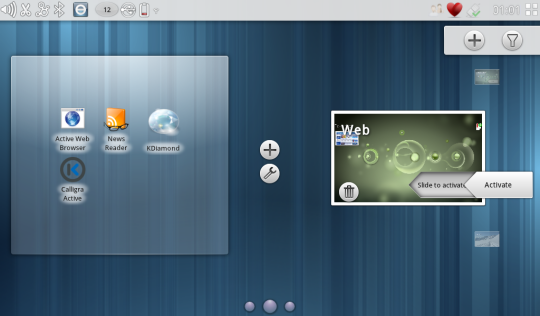 Balsam Professional is, unlike openSUSE, focused on end-users and the user experience on consumer-level devices. Balsam Professional is based on openSUSE, so you might well be familiar with many of the tools already. Note that the installation is possible to do by keyboard only, but a bit more comfortable if you have a mouse available. As the ExoPC does only have two USB ports, one of which will be occupied by the installation medium for the first part of the setup, you either need a USB hub, or a combined receiver for mouse and keyboard. If you don’t have a mouse or the means to plug one in, don’t worry, it’s not really hard to do. In this case, I’d recommend to install the updated kernel package from the KDE:Active repo as soon as the base installation is done, as that makes the touchscreen work, from that point on, you won’t need a mouse anymore. The process should take you about two hours, you might get it done quicker, but should be able to get it running within, say, one evening. The following points provide a detailed guide to installing Plasma Active and the Contour shell onto your ExoPC, using openSUSE. This process is also explained on the wiki, check there for the latest updates. Install openSUSE 11.4: Download this image, Use “dd” to write it to a USB stick, or use the excellent imagewriter tool to handle this for you. after this step, you should have a bootable installation medium in your hands. Insert the USB stick into your ExoPC, boot it and install openSUSE 11.4 onto the machine. It’s wise to enable auto-login, and possibly the SSH server during the installation, since this makes your life a bit easier later on. You need a keyboard for this. The last line increases the priority (lower value means higher priority) for the Plasma Active packages. Install Plasma Active packages on top. This will install the contour shell, some apps and configure your system to run Plasma Active, including tweaks to the defaut configuration that make the whole system more touch-friendly and suitable for mobile use cases. After this step, you have Plasma Active on your system. Reboot to boot the new kernel, the Active shell will start automatically. If you get a black screen past login, use a keyboard and ALT+F2, “konsole” to get a shell and try starting “plasma-contour” by hand. If the command is not found, as root, do “ln -s /usr/bin/plasma-mobile /usr/bin/plasma-contour”. Install additional packages, such as Calligra Active (package “calligra-active”) Kontact Touch (package: “kdepim4”) or the kdegames4 suite. Bringing you a nice collection of useful software. On Tuesday at 14:00 UTC and on Friday at 12:00 UTC, we will organize online install fests on #active (Freenode.net) where we can help you with installation issues, and where you can share your experience with others. Of course you’re free to drop by and hang around at any time. * Use Yast to turn on networking for the wlan card. I switched it to network manager to be able to use the UI instead of the more traditional ifup based approach. * Uninstall applications that are not touch-friendly (e.g. libreoffice) *before* running zypper dup. That will save you a lot of time! OpenSuse is a pretty complete desktop distribution and can take a lot of slimming down for a tablet pc! I have an HP Touchsmart laptop with a touchscreen …. when I install Meego (1.2.90) on it, there is no mouse cursor (presumably because its a touch interface). However, the touch screen does not work. What drivers, if any, can I install? When I boot Kubuntu, i believe the driver is evdev or something similar. Are there any plans for Plasma Active on ARM-based tablets? The Intel ones are too heavy and are getting too hot for my taste. Also thanks to KarlNapf’s comment about yast, i didn’t knew about it and was baffled when i could not use the network manager to configure wlan.